My Messy Manger: Sheepy Shorties! This is only the second wool soaker that I have ever made! The sheep were from a chart I made myself that was inspired by the Baby Sheep Hat made by Melissa at Indigo Mouse (look in her free patterns links on the ride sidebar), which was inspired by the Sheep Yoke Baby Cardigan made by Jen at Looking Glass Knits. The pattern is the free Flowerpot Tots shorties pattern, which can be found here. I really love the shape and fit of these shorties and I definitely plan on making many more from this pattern. Those are adorable. 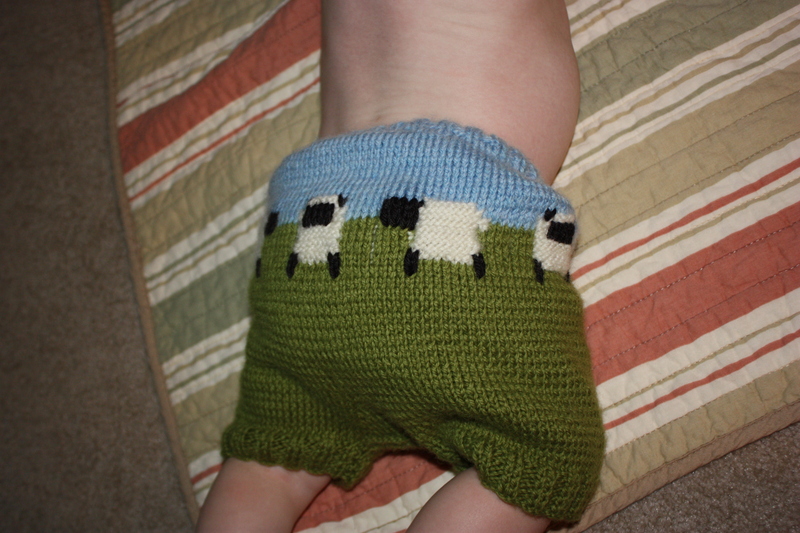 I love using wool shorties. They work so well. I am only sad that I don't have more babies to make them for. Wow! Those shorties are excellent! Thank you for posting the pictures and linking to my pattern.